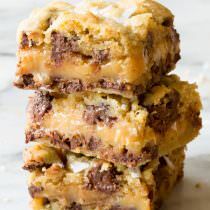 Amazing Salted Caramel Chocolate Chip Cookie Bars, with gooey caramel centers. This cookie bar recipe is so delicious, everyone will ask for the recipe. Press half of the cookie dough into the bottom of the prepared baking dish. In a medium sauce pot, add the sweetened condensed milk and unwrapped caramels. Set over medium-low heat and stir until the caramels melt, making a smooth caramel filling. Pour the filling over the cookie dough base. Drop the remaining cookie dough over the caramel filling in small teaspoons-sized clumps. Bake the bars for 25-30 minutes, until the center is just set. Sprinkle with sea salt flakes and allow the bars to cool completely. Then lift the bars out of the pan by the edges of the foil and cut. Store in an airtight container at room temperature for up to 3 days.